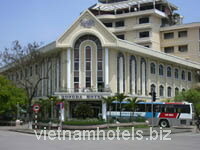 Dong Da Hotel, situated in the center of Hue City, with an ideal place of peaceful environment surrounding, …. is a international standard 3 star hotel. The Room Facilities at Dong Da Hotel in Hue in Vietnam presents you with the fifteen Super suite rooms that include a standard room and a small guest room. The Super Suit has independent balconies that give you lease to get a city view. The rooms are done up to perfection with all set modern amenities. The Room Facilities at Dong Da Hotel in Hue in Vietnam presents you with a Family Room types - that has two interconnected rooms and an adjacent bathroom. The rooms served are large and ensure a pleasant stay for your family. The Room Facilities at Dong Da Hotel at Hue in Vietnam also has in store: 20 Standard Room that has 18 double rooms and 2 single rooms. Car rental service, Money exchange. Safety deposit boxes, 24 hours security, money exchange. Business center: Conference Rooms, Internet and E-mail. There are 2 luxurious dining rooms that can serve up to 450 people. The dishes range from European to Vietnamese cuisine, in particular many Hue specialties that were once the favorites of the Vietnamese Royal Family.